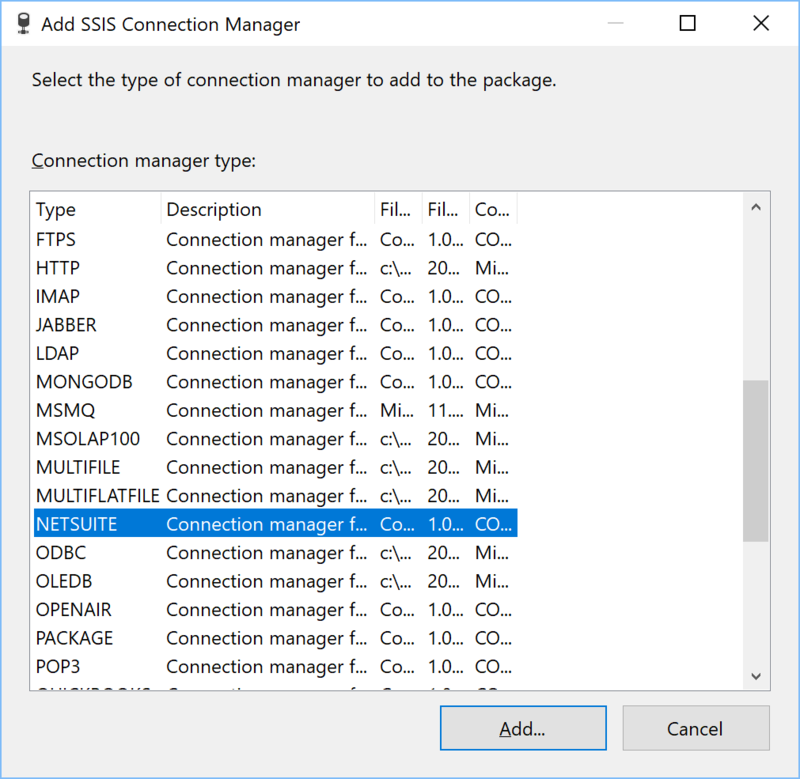 NetSuite Connection Manager is an SSIS Connection Manager for establishing NetSuite connections. Use the API to build components based on the NetSuite Connection Manager. We recommend using NetSuite Web Services Usage Log when designing solutions. In this section we will show you how to set up a NetSuite Connection Manager to access your NetSuite service. Scroll down the list to find the NETSUITE connection manager and select it. Once the connection manager dialog opens, ensure the Authentication Type is set to Session. This is the default. Enter your User name, which is an email address associated with your NetSuite account. Locate or generate an Application ID. Go to Setup > Integration > Manage Integrations and click on Manage Integrations. If an application for COZYROC shows up in the list, copy the Application ID associated with it and skip to step 15. If there is no existing application in the list associated with COZYROC, Go to Setup > Integration > Manage Integrations > New and click on New. Enter a Name for the COZYROC SSIS+ integration tool. Make sure the box for Token-Based Authentication is unchecked and only the box for User Credentials is checked. Click Save. NetSuite will generate an Application ID. Copy the Application ID just created by NetSuite. Paste the Application ID into the Application ID field in the connection manager dialog. In NetSuite, Navigate to Setup -> Integration -> Web Services preferences and click on Web Services Preferences. Locate the ACCOUNT ID field and copy it. Paste the Account ID into the Account ID field in the connection manager dialog. Congratulations! You have successfully configured a NetSuite connection manager. 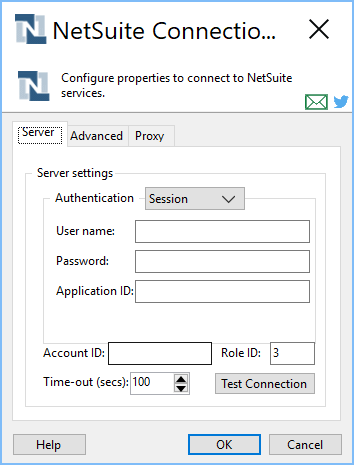 Use the Server page of the NetSuite Connection Manager dialog to specify properties for connecting to NetSuite service. Session Use user name and password session authentication. Token Use token-based authentication. For information how to enable token-based authentication, check here. Specify user name to access NetSuite. Specify password to access NetSuite. Login to the NetSuite portal. Enter a Name for the application that will be integrating with NetSuite. Copy-and-paste the generated Application ID. Specify consumer key used in token-based authentication. Specify consumer secret used in token-based authentication. Specify token identifier used in token-based authentication. Specify token secret used in token-based authentication. Use the Advanced page of the NetSuite Connection Manager dialog to to specify additional properties if your server configuration is different from the default. 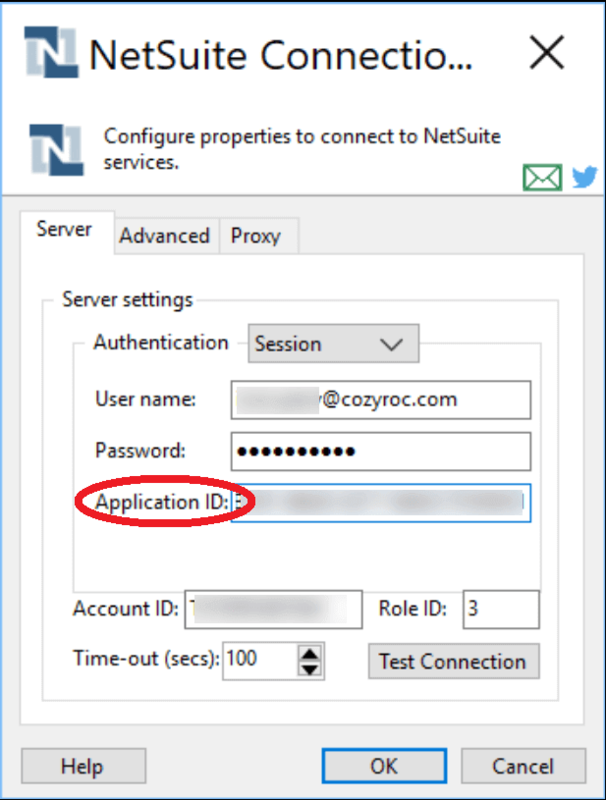 Use the Proxy page of the NetSuite Connection Manager dialog to specify properties if your server is behind firewall. Where can I find the documentation for the NetSuite Connection? I am trying to connect to Netsuite, but I am receiving an error message "Request was aborted , couldn't create a SSL /TLS secure channel". New: Updated web service proxy to version 2018.2. New: Support for token-based authentication. New: Updated web service proxy to version 2017.2. New: Support for automatic renewal of expired session. New: Updated web service proxy to version 2016.2. New: Updated web service proxy to version 2015.1. New: Updated web service proxy to version 2014.1. New: Updated web service proxy to version 2013.1. New: Updated web service proxy to version 2012.2. Fixed: Failed with error "Your connection has timed out. Please log in again." when trying to connect.